The walls of Cartagena, at the edge Caribbean Sea, served as protection for the city. 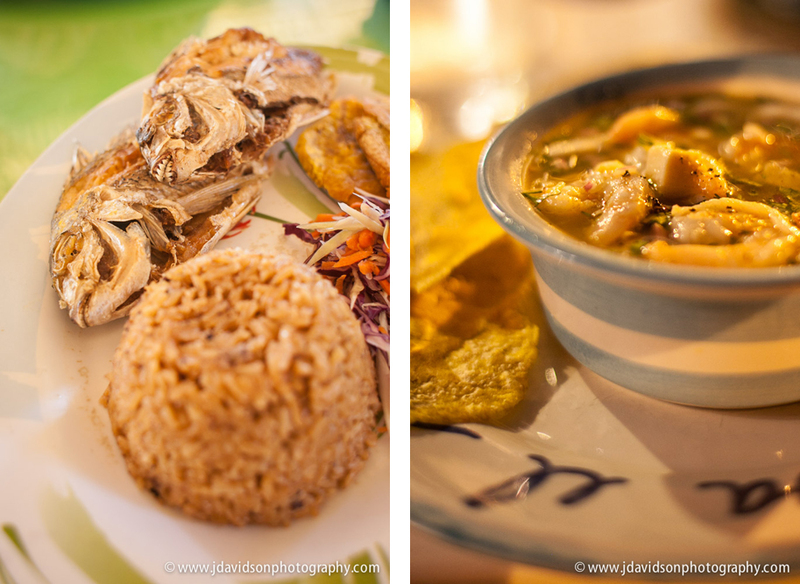 Cartagena is a city that well known, even to those who have not yet visited Colombia. It is definitely a must-see destination, with its historic walled city, beautiful architecture, and vibrant nightlife. Nearby, Santa Marta is impressive as well. It boasts better beaches and fewer tourists. It was a great place to spend Christmas among the people who live there. A man walks through a pedestrian street where records are being sold in Santa Marta. After a visit with my family via Skype (which along with TripAdvisor is one of the technological gifts in the last decade for a traveler in my opinion), I had lunch on Christmas Day at a place recommended by my hostel that’s only distinguishing feature from the street was a doormat that said, “Welcome.” Once inside I was greeted with numerous murals on the walls and ceiling, a fresh seafood dinner, and a friendly fellow patron. Our conversation was intermittent, because he, like all the locals that entered, were engrossed with the TV. The funeral of Diomedes Diaz, one of Colombia’s most popular musicians, was being broadcast. While watching it I was reminded of eyes glued to TVs in the US during Princess Di’s procession. 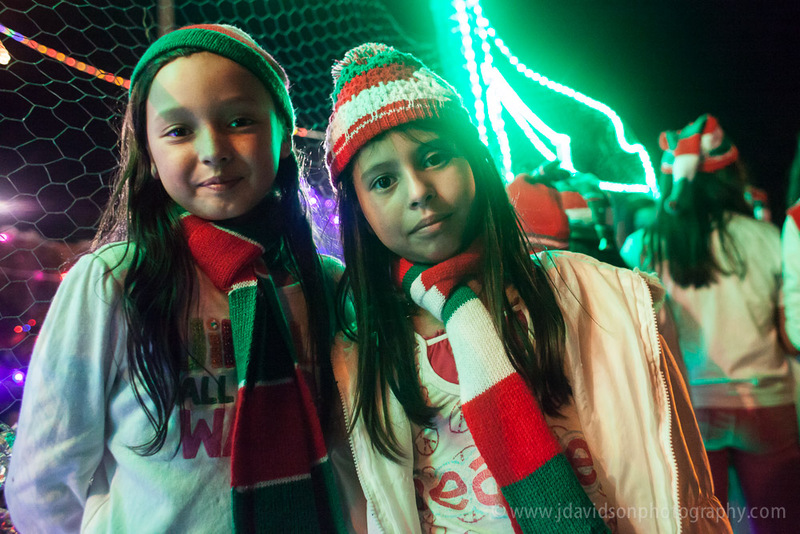 For some in the coastal areas, Diaz’s funeral overshadowed the celebration of Christ’s birth celebrated on the same day. 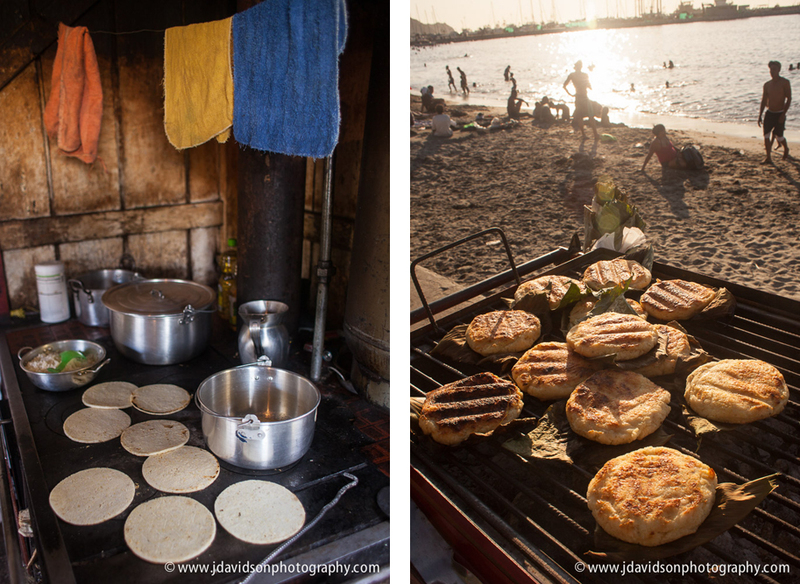 Later in the afternoon, I did what many locals do on Christmas Day…I went to the beach! Locals watch the funeral of Diomedes Diaz in a colorful restaurant (left). A young girl enjoys the beach on Christmas Day in Santa Marta (right). Boys jump into the Caribbean Sea on Christmas Day in Santa Marta. The culture and history of Cartagena is evident on every street of the its historical center. Pirate raids, the Spanish Inquisition, international trade of precious metals and slaves: these are just some of the stories that this walled city holds in its past. Today the fortress walls also serve as a great place to watch the sunset over the Caribbean Sea. Within the historic center, the city’s architecture retains its colonial character with rich colors, flower covered balconies, and arched walkways. Food vendors, horse-pulled carriages, and tourists meander through the streets, adding the the beauty of experiencing this special place. A horse-pulled carriage pauses near the Clock Gate in Cartagena. A couple watches the sunset from Cartagena’s wall as a soccer game is played below. The modern neighborhood of Bocagrande stands in the distance. The colonial architecture of Cartagena adds to the beauty of the historic city. 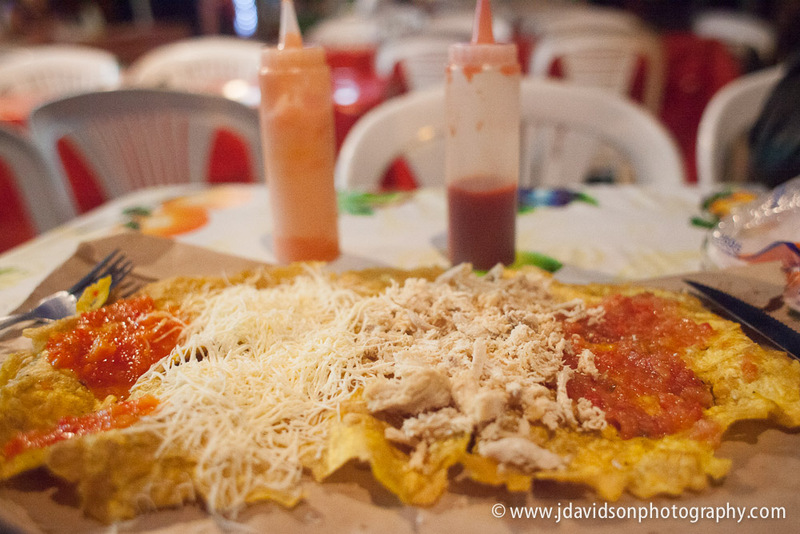 In the Getsemaní neighborhood, brightly colored murals cover walls between hostels, cafes, tiendas, and salsa bars. Artist studios and small local businesses make their home in many of the historic buildings there. 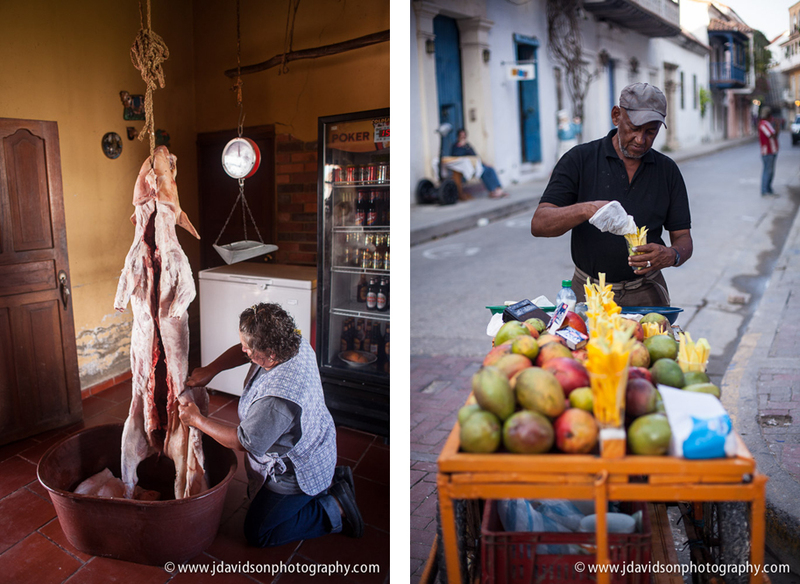 Cartagena’s Getsemaní neighborhood is home to some of the city’s workforce and artists. A tailor makes uniforms for hotel employees (left). Guillermo is a painter whose studio is housed in this neighborhood (right). Walking through the streets here, I never knew what waited around the next corner. The streets of Cartagena are perfect for wandering, and the romantic beauty of the place makes it easy to lose track of time. A quiet evening in Cartagena’s historic center. 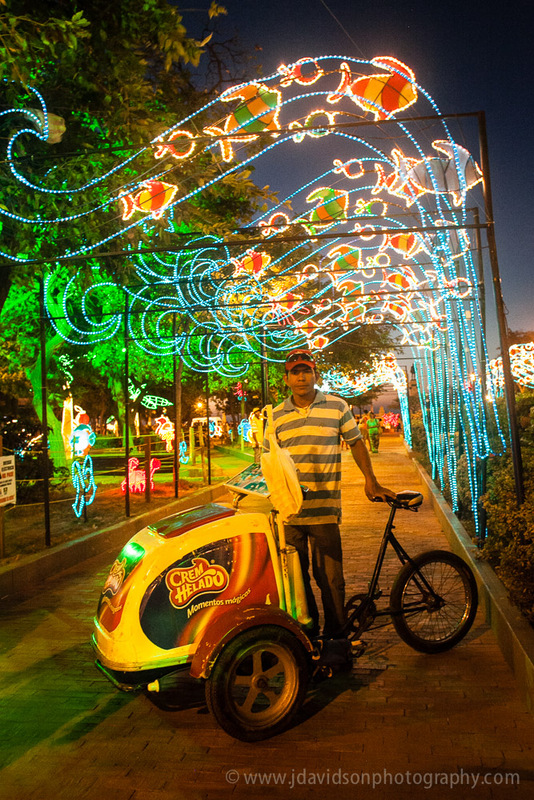 The Christmas light displays in Colombia are a sight to behold. 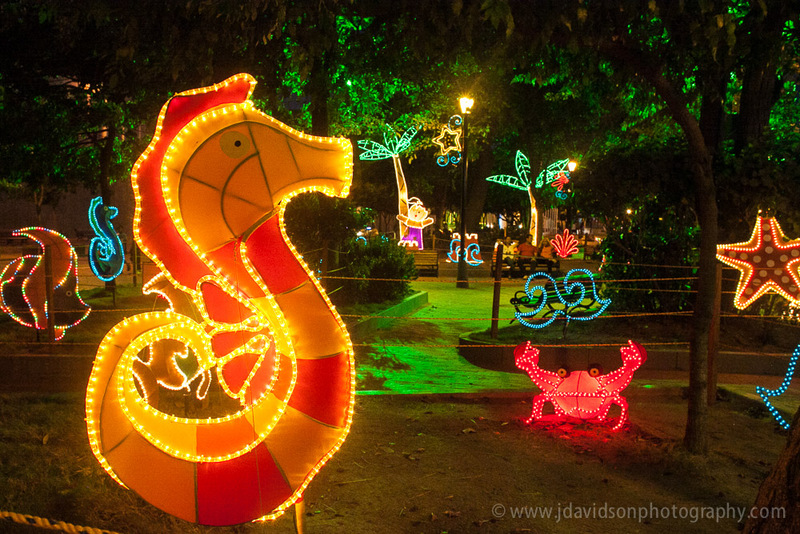 While I did not make it to Medellin during this trip, which is considered to have the most extravagant displays in the country, the festive lights I did see where very impressive. Each place I visited during the holiday season expressed the character of the town through their unique displays. Everyday I felt a childlike excitement well up in me as the sun went down, the lights turned on, and the people came out to congregate in the public areas adorned with sparkles of color and light. 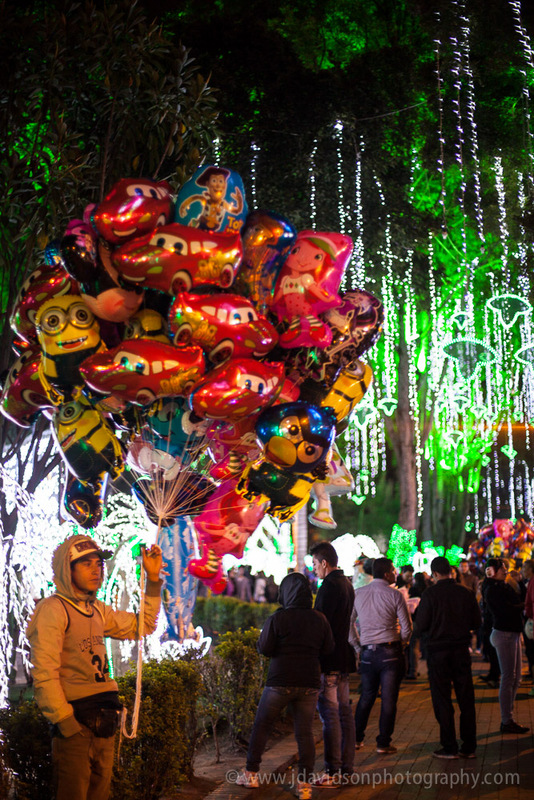 The trees of Bogotá’s Independence Park are dripping with lights as locals and vendors stroll underneath. 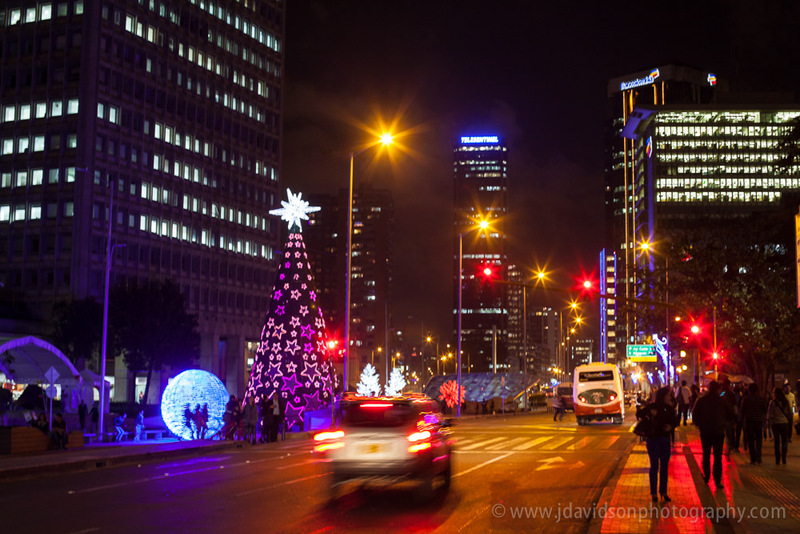 A giant Christmas tree towers over other larger than life displays along one of Bogotá’s busy streets. 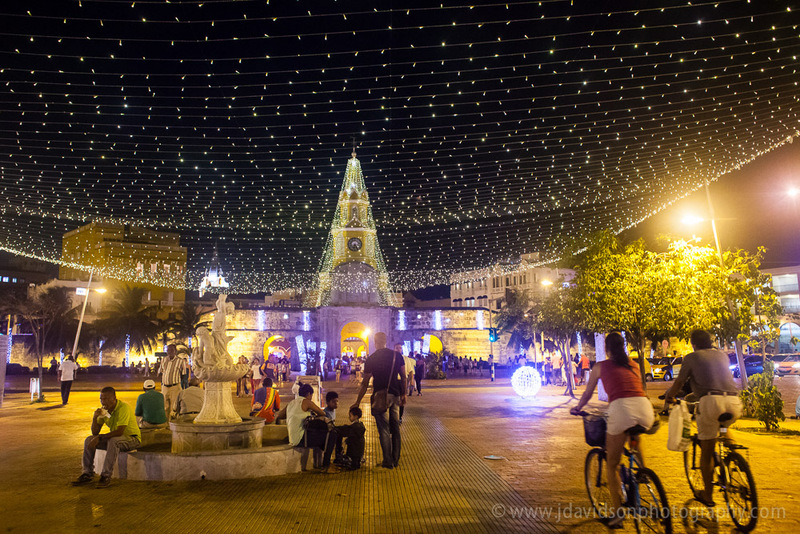 The elegance of Cartagena’s historic center shines through the white lights covering the clock tower at the city’s entrance. A long promenade alongside the Caribbean Sea in Santa Marta contains a multitude of festive sea creatures and palm trees, with exuberant children interspersed among the marine themed lightscape. 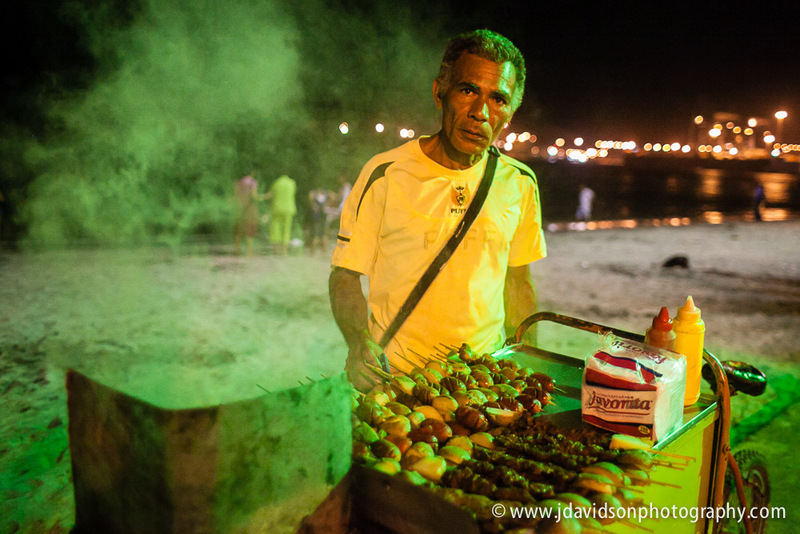 Ice cream vendors stay very busy in this seaside park where many families come to enjoy the displays and the warm Caribbean nights. 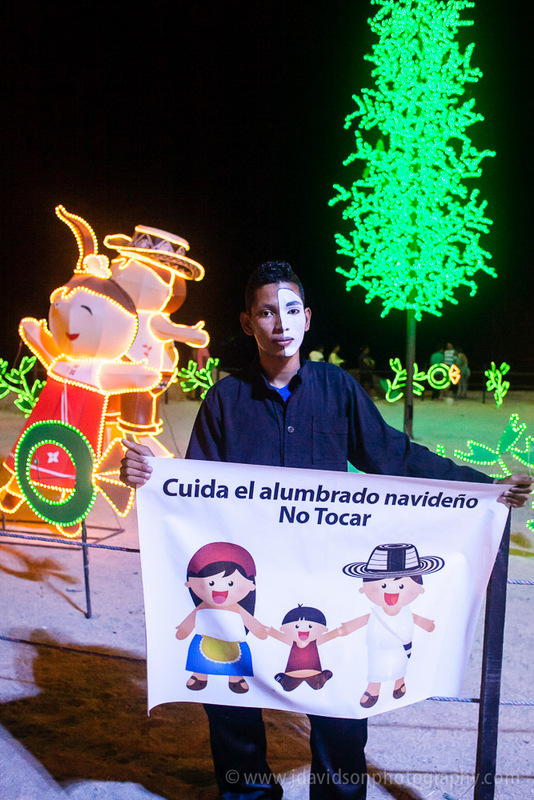 A young man stands quietly reminding those visiting the park in Santa Marta to be respectful of the city’s holiday display. 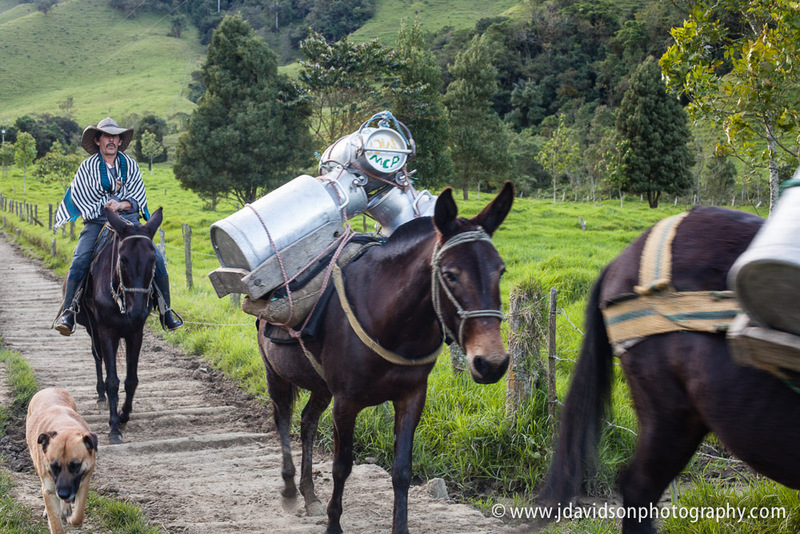 In the small village of Villa de Leyva, novenas took place in different parts of the town each night. Here two young friends who sang at the evening’s service, pause in front of a street-side nativity. 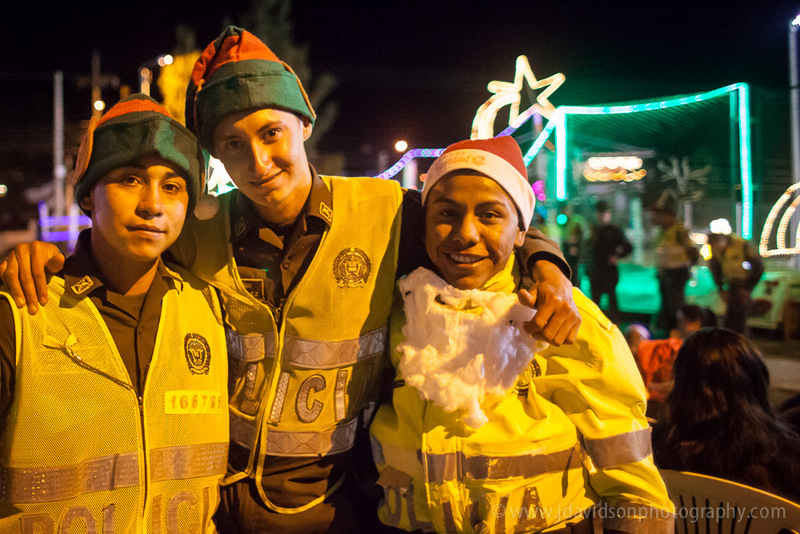 Local police officers join in the holiday spirit during the novenas in Villa de Leyva. 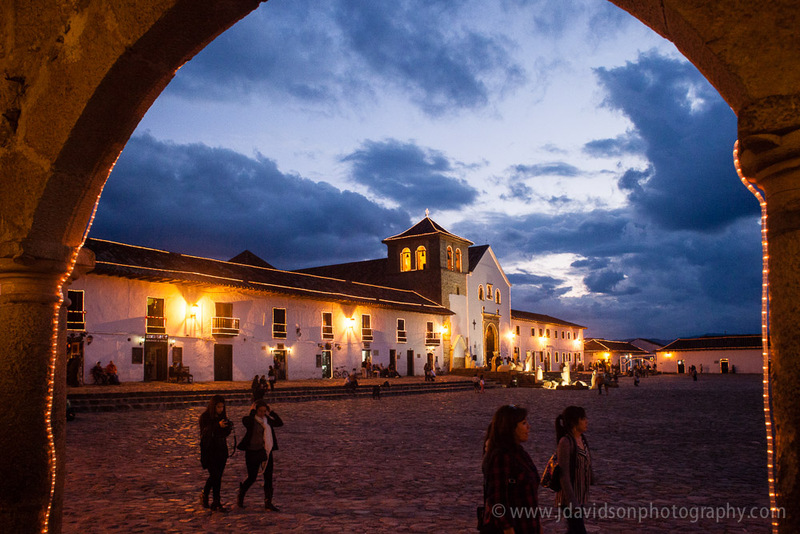 Beauty through simplicity characterizes the light-outlined plaza in Villa de Leyva. This display compliments the town’s all-white architecture perfectly.